Integration on High-power, high-performance, and power management functions is the market trend to the high-end power supply. Being the leading brand of power supply, MEAN WELL has officially entered the field of high-wattage system power solution since 2018. By integrating 3.2kW fully digitalized rack-mount power supply DRP-3200 and charger DBR-3200 series power modules with power shelf DHP-1UT-A, a power system featuring high efficiency, high reliability and active current sharing parallel function is made. Then, add in RKP-CMU1 with complete communication, monitoring and control functions to the power systems that are in parallel connection and assembled in the standard 19" instrument cabinet, we effectively create complete and competitive system power solutions for various applications that the high-end markets are in need of. Currently, available product solutions range from 12.8 kW to 64 kW. In the future, 100 kW, 150 kW and even higher power solutions will be launched. System power solutions can be applied to application scenarios such as electronic product burn-in systems, UV curing equipment, and laser diode equipment, horticulture lighting, building exterior lighting, fishing lights, electric vehicle charging, and information communication equipment, covering industrial, lighting, charging and information communication technologies and other industrial segments. All series of standard products are available in stock, customers do not have to pay for products development costs (NRE) and Tooling fees which enables the benefits of product competitiveness to our customers. The entire product line has passed UL, CUL, TUV international safety regulations and CE, FCC electromagnetic compatibility certifications. Customers no longer have to wait for long verification time and pay expensive certification fees, effectively shortening time to market and enhancing market competitiveness. 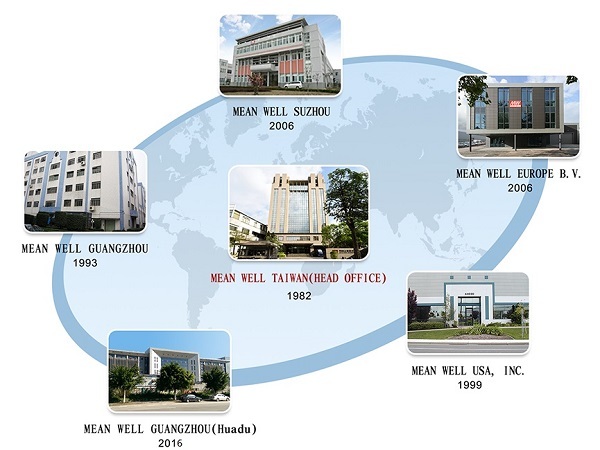 In addition, MEAN WELL has accumulated more than 35 years of professional experiences, thus our FAE team can provide technical consultation and support services according to different application scenarios. You are more than welcome to contact us at any time, and anywhere!